WILLEMSTAD – The local aviation company InselAir pays no premiums and taxes. The airline has an agreement with the Ministry of Finance. The reason is the poor financial situation of the company. According to sources, the company is on the border of bankruptcy. 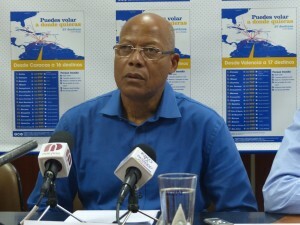 As was announced this morning the government has appointed a committee headed by the former Prime Minister of the Netherlands Antilles and financial expert Etienne Ys to find a structural solution for the ailing aviation company. The committee reports to the government. According to the Minister of Economic Development Eugene Rhuggenaath, the company is too big to go under. A bankruptcy would inflict serious damage to the economy of the island. A similar case happened in 2013 with the defunct local airline Dutch Antilles Express (DAE). DAE also requested assistance from the government, but to no avail. The company declared bankruptcy that year. DAE also had problems to get its dollars from the neighboring country Venezuela.